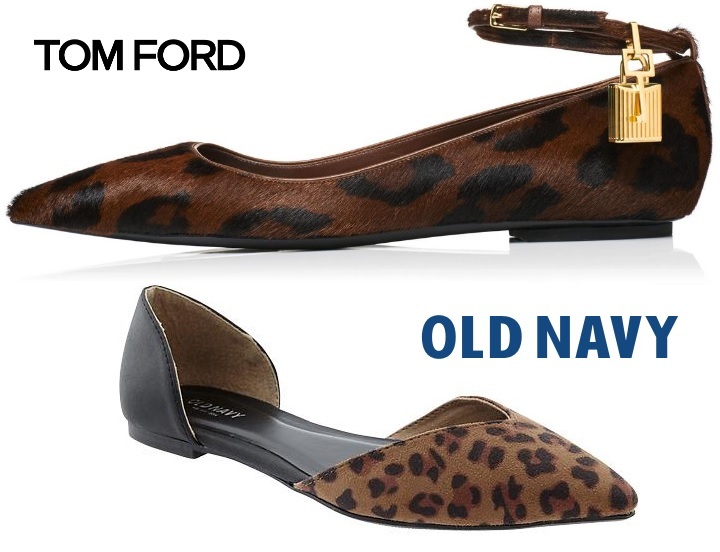 Basics For A Bargain: Pointy Animal Print Flats, Tom Ford Vs. Old Navy! I am all over the new September issues of my favorite fashion magazines, loving all of the style inspiration inside the pages, especially when I’m seeking Basics for a Bargain. So, Lucky magazine is among my go-to publications to expand my wardrobe, as well as shoe & accessories collections. I’m always a big fan of animal prints, which make a great neutral as accessories with some bold solid pieces like a sheath dress & pumps, a belted jumpsuit, or crisp separates with sandals. Now that I’m looking ahead to the fall, I’m pretty excited about wearing flats when I’m headed out & about to my jobs & class. In the pages of Lucky, I found these gorgeous panther print hair calf padlock ballerina flats ($1,190.00) in cognac by the one & only, Tom Ford. I was immediately reminded of my recent coupon-toting excursion to Old Navy, where I found these animal print d’orsay flats ($16.00). However, the pair that I ended up bringing home was actually reduced to under $8 in stores. I tried these pointy toe flats on & was very excited at the possibilities of how I can wear them: with a little black dress, a cardigan-blouse-pencil skirt combo, & when I’m trying to transition some of my summer favorites into fall like a maxi dress & denim jacket. For more fashionable animal print flats on the market right now, check out other picks from Steve Madden, Christian Siriano for Payless, Lucky brand @DSW, & Nine West. Where do you like to shop for new fall footwear? What designer do you turn to for style inspiration? To check out more fall-friendly posts, take a look at Jamie Chung’s fashion blog, budget-friendly skirts from Target & H&M, & Olivia Wilde’s September Glamour shoot! Happy Styling! This entry was posted in Basics for a Bargain, Inside A Style Blogger's Closet, Luxury Look-Alikes For Less, Magazine Must-Haves, Quickie Darling Deal & Steal, Show Me The Shoes, Splurge or Save?, Style Darling Daily and tagged affordable fashion, animal print flats, ballerina flats, Basics for a Bargain, Christian Siriano, designer, DSW, fall fashion, fashion, Inside A Style Blogger's Closet, leopard flats, Lucky, Lucky brand, Lucky Magazine, Luxury Look-Alikes for Less, Magazine Must-Haves, Nine West, Old Navy, Payless, pointy flats, Quickie Darling Deal & Steal, Show Me The Shoes, Splurge or Save?, Steve Madden, style, style for days, Tom Ford. Bookmark the permalink. ← .Com Darling: Actress Jamie Chung Turns Fashion Blogger With ‘What The Chung?’!